Smartphone maker HTC is going through a tough time — and having something of an identity crisis that’s playing out as a rebranding exercise. That’s why it’s spent millions hiring Robert Downey Jr to spice things up with its Here’s To Change campaign. It’s also, apparently, got a few other attention-grabbing tricks up its sleeve. Such as the gizmo pictured above. Part vapourware, part steampunk fantasy, pure marketing madness. No it’s not a leftover prop from the latest Tim Burton flick. The Gramohorn II — for that is its ludicrous name — is HTC UK’s contribution to the struggling mobile maker’s internal cultural revolution. What actually is it? It’s audio kit for the outré HTC One user: a passive speaker smartphone dock designed to grab the tiny timbres issuing from the phone’s front-facing speakers and flick them through its twin horns like a Pamplona bull dispatching a pair of overweight tourists. Or actually that’s its secondary function, after the primary one of grabbing consumers’ eyeballs and rattling them in their sockets. If it’s eyes on its logo HTC needs — actually it’s dollars in its coffers but the former tends to lead to the latter — then this mystical hardware unicorn is surely going to deliver. Not so much HTC as WTF?! But in the smartphone popularity contest where Samsung is the ruling Gladiator then anything is better than being invisible. So it’s out with ‘quietly brilliant’ and in with ‘WTF’ blared through a pair of oversized ear trumpets. Bravo HTC, bravo. Say what you like about the Gramohorn II but one thing is for sure: it’s not quietly brilliant. HTC hasn’t come up with this chunk of craziness on its own. 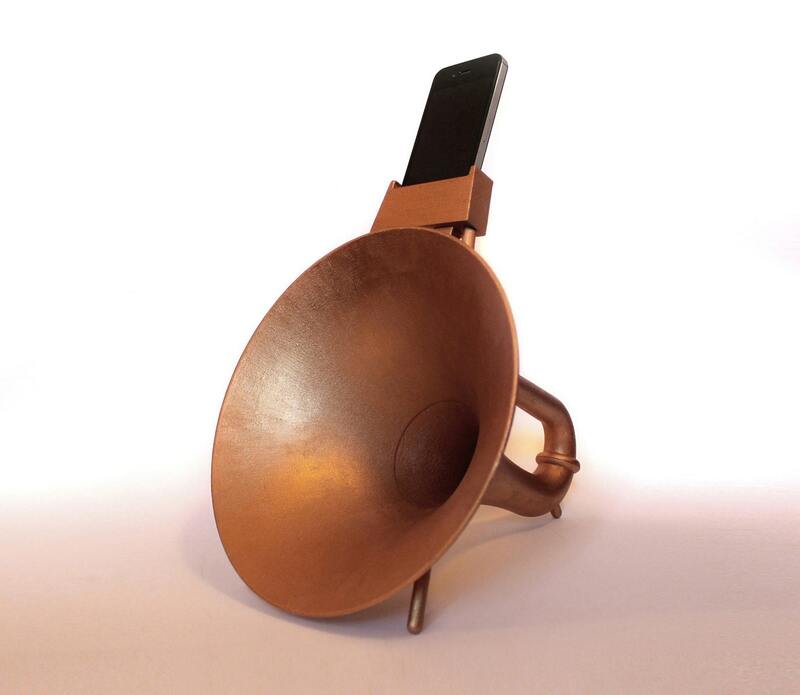 It engaged a young UK designer called Justin Wolter to do that for it — maker of the Gramohorn II’s uni-trumpeted predecessor (which was, er, for iPhones). Wolter came up with the dual-trumpet remix of his earlier design, sketched it out and then with a little judicious use of 3D printing, the Gramohorn II was born. These days crazy is that easy. Print on demand means there’s never going to be a warehouse full of unloved Gramohorn IIs. These bad boys are individually made to order. And at £999/$1,600 each (for a plaster-based resin Gramohorn II) — or a frankly insane £4,999/$8,000 for the milled steel version — buyers are being deliberately discouraged from actually getting their hands on the Gramohorn. In all likelihood because it’s going to murder your music by trampling tinnily all over it. Audiophiles avert your ears. Even hipsters would balk at a price tag with that many bells on it. To kick-start our Here’s To Creativity campaign Justin has taken the concept of the HTC One’s front facing BoomSound™ stereo speakers and pushed it to the extreme. His design is the physical embodiment of BoomSound incorporated within a unique, dramatic and stylish sculpture. The design aims to function as both a functional consumer product as well contemporary art. As such, it hopes to capture and element of curiosity as well as prompt further thought / discussion. Based on key acoustic principles, the design does what it says, in successfully amplifying sound waves using resonance. The Bauhaus-ian mantra of ‘form follows function’ was always in mind during design development. It also sounds as if the Gramohorn II will be the first in a series of designer eyeball-grabbers coming out of HTC’s UK office. This sort of grassroots craziness may not turn HTC’s tanker around but in a mainstream smartphone space that’s become slabbish and staid it sure is fun to see something a little nuts going on.